I was impressed by the modern and clean feel to the office. 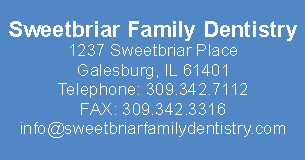 We recently switched to Sweetbriar Dentistry from an office further away from Galesburg. From the moment we walked in until the moment we left, we were treated in a welcoming, comforting, and professional manner. My seven and eight year old were completely at ease during their X-ray and cleaning. I’m extremely pleased! Never been, but I hear the staff is great! I was someone that didn't like to go to the dentist and was actually scared to go. But no more, Dr. Welty is great 👍 and very caring about my fear. And Beth is fabulous 😍---I won't let anyone else clean my teeth!!!!! Love Sweetbriar Dental!!! They have a great staff!!! Very caring and will address all your dental needs! It is always a pleasure to visit your office. The professionalism is top notch. The quality of the cleaning is like I've never seen before. A+ all the way around. Absolutely best dentist office I have ever been too, everyone is very personable and always welcoming with a smile! 10/10 would recommend to anyone!!! Our whole family receives excellent dental care, including checkups, fillings, crowns, and a root canal, from Sweetbriar. Dr. Welty, the nurses, and staff are all amazing! After yesrs of avoiding the dentist, I come regularly. My adopted son was deathly afraid of dentists, but he gladly goes here. I've recommended them to so many of our friends and family bevause they are the best!. I enjoy coming there everyone is very friendly. I really liked my last dental hygienist she was very nice. We love Sweetbriar Dentistry. The office is well run and organized. We never have to wait and everyone is so pleasant. Our kiddos have always done so well, and I know it is because they are so patient and explanatory with them about what they’re doing. Great Staff and we was in and out so fast! Under 35 min for wisdom teeth to be removed! Absolutely wouldn’t go anywhere else, so professional but always caring and understanding! Love Sweetbriar Family Dentistry! My husband has a real fear of the dentist and the staff were so patient and comforting. They took their time explaining everything and he felt so much more at ease. We won't be going anywhere else! Dr. Welty & his staff are awesome! Very friendly and accomodating. Dr. Welty went over and above the call of duty. I highly recommend them. Thank you so much. Everyone at Sweetbriar is friendly. They’ve got great staff that listen to concerns and include you in the planning/procedures. Highly recommend them! Great staff! I felt completely comfortable and confident in the work that was done, even though I didn’t plan for it. They definitely made me feel like a priority and want to aggressively get my dental health where it should be. I definitely recommend. Everyone is so friendly and nice! Going to the dentist isn't the most fun thing to do but they always make it easy! Glad I found Sweetbriar Family Dentistry! I've been going to Sweetbriar (formerly Dr Owen) for 12 years. They are by far the best place I've ever been. The hygienist Beth is out of this world! I've had 3 cavities filled with zero pain and my daughter had beautiful results with her braces. Will not go anywhere else for our dental care! Good dentists are hard to find. My dental history, prior to moving to the area two years ago, has been a difficult one and I find that the team at Sweetbriar Family Dentistry has addressed each issue with professionalism and with courtesy. My family has been pleased with their service and gladly recommend them to anyone seeking a new dental provider. For the first time getting my teeth cleaned wasn't annoying. And all the fillings I've had to get have been painless and quick. Everyone is always so friendly! Dr Welty gives great dental care!! Sweetbriar Denistry for me has been fantastic. I started going there because I hated my smile. Always covering up. They were upfront and honest about my estimate. Since, I have a smile back, my mom comments all the time how good my teeth look! I am still going for things I need but I am excited about my results now and hopefully the rest of my visits! The employees are very professional and friendly. Thank you all for everything! such a friendly office and great staff. We are very thankful to have Dr. Adam back in town for our dental needs. This is just a great group and we are so pleased to have all of them. Highly recommend! Employees are nice and very personable!! A huge thank you to everyone at Sweetbriar Family Dentistry. ⭐️They did a wonderful job taking care of Steve’s teeth today. Thank you for being a gem in Galesburg! !